A Memorandum of Understanding (MOU) was signed between Halal Research Council (HRC) Pakistan & LCM Consulting Nigeria Limited. Halal Research Council and LCM consulting Nigeria limited have signed an agreement in Lahore. 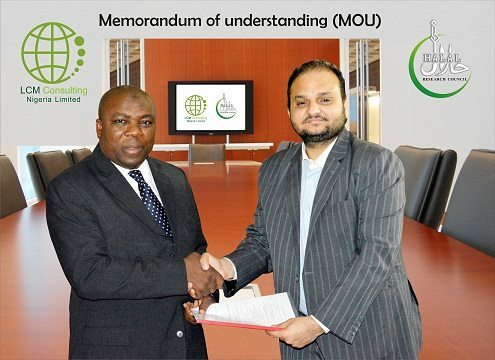 The MOU was signed by Muhammad Zubair Mughal, Chief Executive Officer Halal Research Council and Mohammad Lawal Shuaibu, Managing Director LCM consulting Nigeria limited. Both the organizations will work together for the promotion of Halal industry as Halal Research council will facilitate the LCM consulting Nigeria limited in different aspects of Halal industry like Capacity Building, Research & Development, Shariah Advisory etc. As per agreement, LCM will promote the distance learning program of Halal Research Council with different universities and institutes related to food technology in Nigeria. Mr. Muhammad Zubair Mughal, CEO Halal Research Council, mentioned that being an important country in Africa, Nigeria has a population of almost 180 million and half of them are Muslims, so Nigeria can be an important target market for the growing of Halal industry and it can serve 58 other countries of Africa as well. He said that the growing concept of Halal is not only limited to Muslim countries as it is getting popular with Muslim and even Non-Muslim communities in Africa and Europe. In Future, the Continent of Africa can play an important role for the development of Agro-economics Halal industry wherein Halal meat, Halal dairy, Halal tourism, Halal logistics etc. will gain importance. He mentioned that Halal Research Council is not only interested for the development of Halal Industry in Nigeria but also focusing for development of Islamic Banking an Takaful Industry through their sister concern “ AlHuda Center of Islamic Banking and Economics”, who already have a handsome presence in African Countries. Mohammad Lawal Shuaibu, Managing Director LCM consulting Nigeria limited, said, Pakistan has lately gained a good repute in International halal industry. According to the agreement, the best halal practices of Pakistan will be utilized for the development of Halal industry in Nigeria. Halal Research council is an international institute, which is serving halal industry for over five years through education, capacity buildings, trainings, research and other areas in collaboration with strategic partners like PIHH Malaysia, Instituto Spain, Halal Transactions of Omaha USA, GmbH Germany, UHB Uganda Halal Bureau, IIDZ Australia, TITICF Honk Kong and others in more than 19 countries around the globe.